Put away your car keys and go ahead and order that seafood platter...you'll be able to walk it off! This unique house is all about LOCATION. 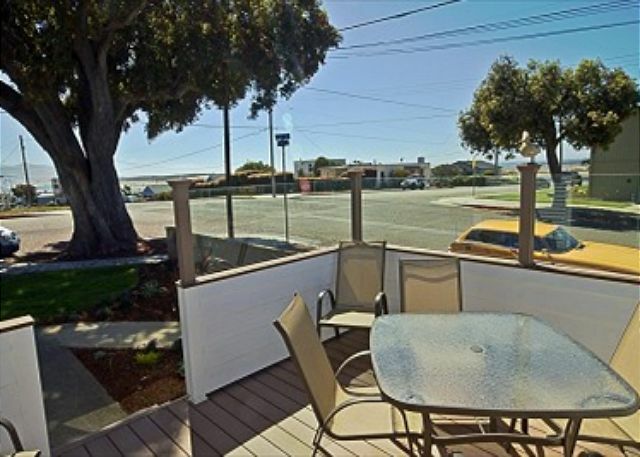 Situated just one block from the embarcadero and one block from downtown, the great location allows you to leisurely stroll to see many of the wonderful things Morro Bay has to offer. 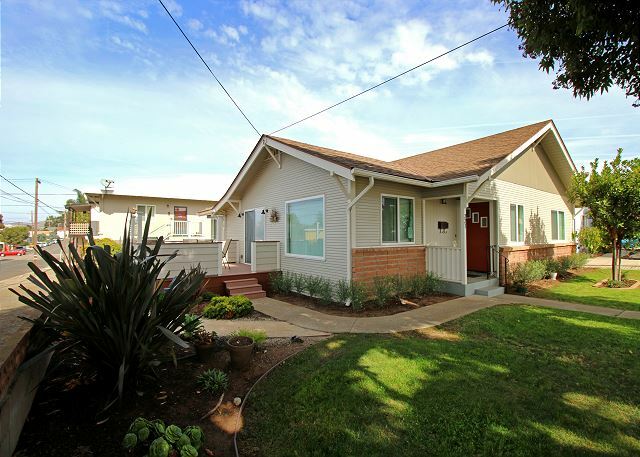 This newly remodeled 1960's home has maintained its' simple, vintage style with an added modern flavor. 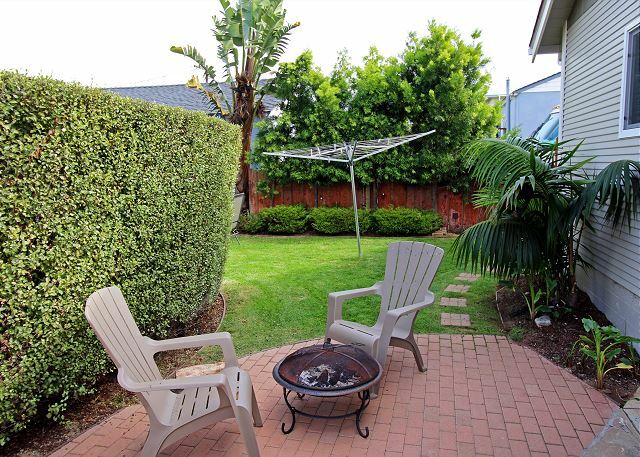 It is equipped with all the necessary conveniences; dishwasher, gas Bar-B-Q, Wi-Fi, Flat screen TV in every room, washer/dryer, Tempurpedic sofa bed, and an outdoor shower/rinse-off area. 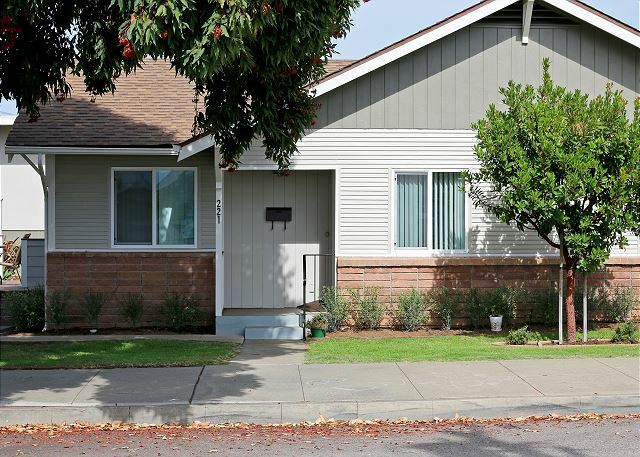 The spacious corner lot, coupled with an abundance of windows give this modest house an open, airy feel. 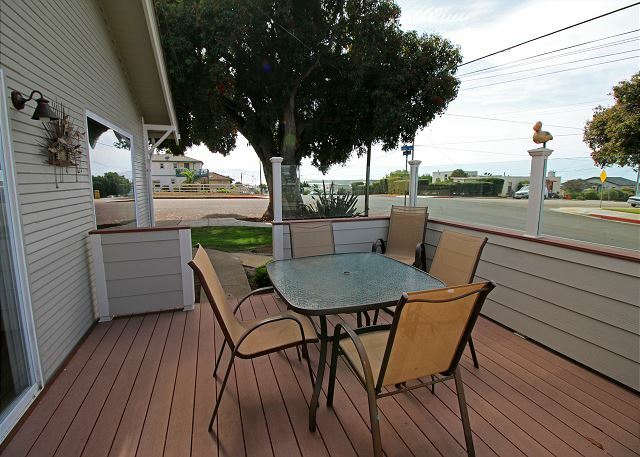 If you are looking for a place where you can feel at home, comfortable, and relaxed, while still in the heart of Morro Bay, you will fall in love with this house! 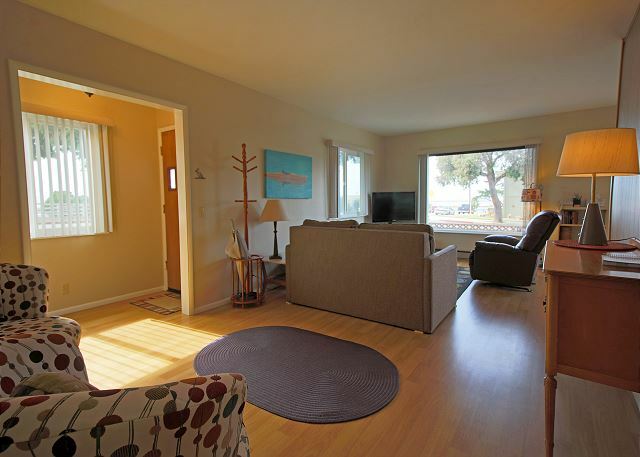 Walking distance to the Beach, Morro Rock, shops, restaurants. 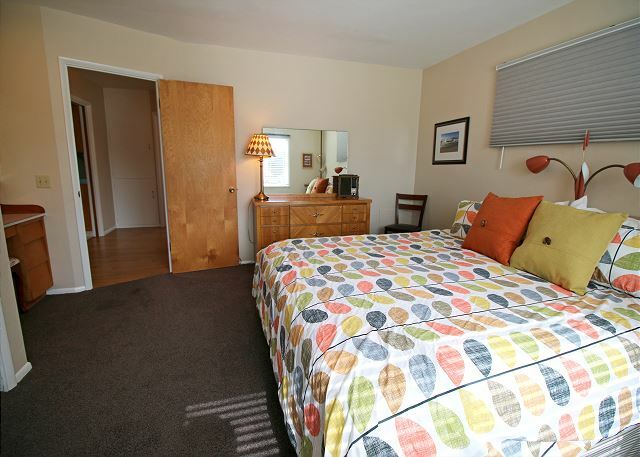 Flat screen TV, Cable, Wi-Fi, TV's in all 3 bedrooms, & stylish decor. 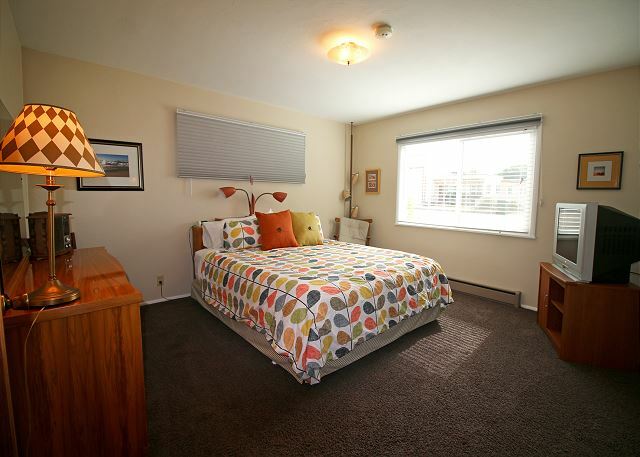 Wi-Fi, Cable, 1 King, 1 Queen beds, Trundle bed can be used as 2 twins or makes into a King size. 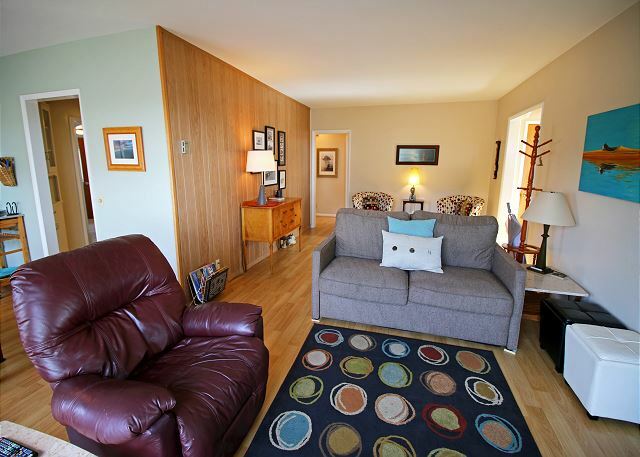 Trundle sofa sleeper in living room is state of the art, no bars, Queen size Tempurpedic. 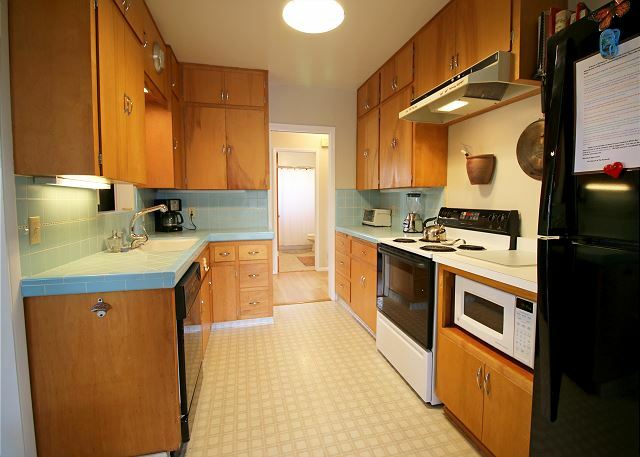 Full kitchen includes dishwasher and coffee maker. 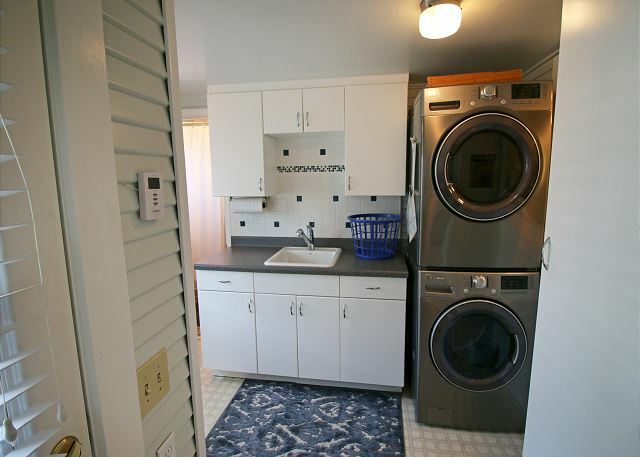 Full laundry room with built in ironing board, beach towels provided, games, books. Gas BBQ. This home is sure to become your favorite to return to again and again. It is a lovely home and we enjoyed staying there. 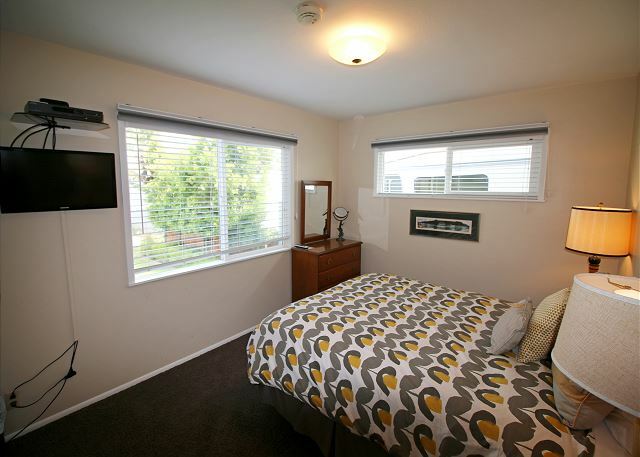 221 Dunes - A great place to stay. We stayed for two weeks. 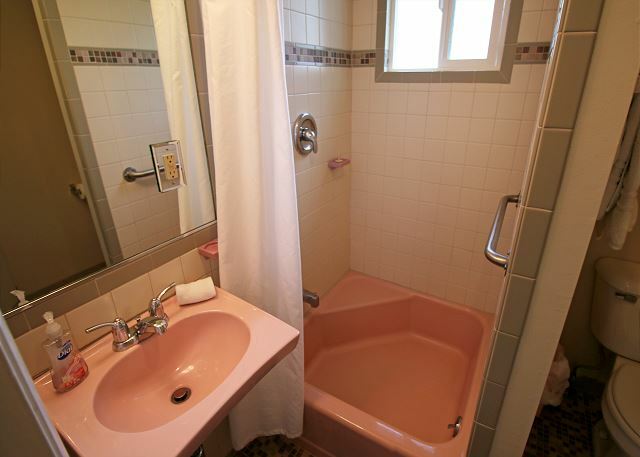 The house had retro charm, many amenities and clean. One could easily walk to the bay and embarcadero. The management gals were very helpful. We enjoyed our stay very much. Relaxing and peaceful. Will be back. The house is in a great location for walking to everything. 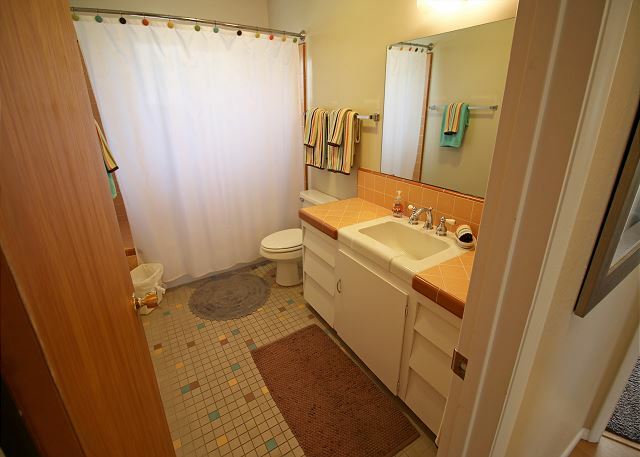 It's really well appointed and clean and I couldn't be more pleased. Of course this was the second year we've had it for the month of FebrUary! 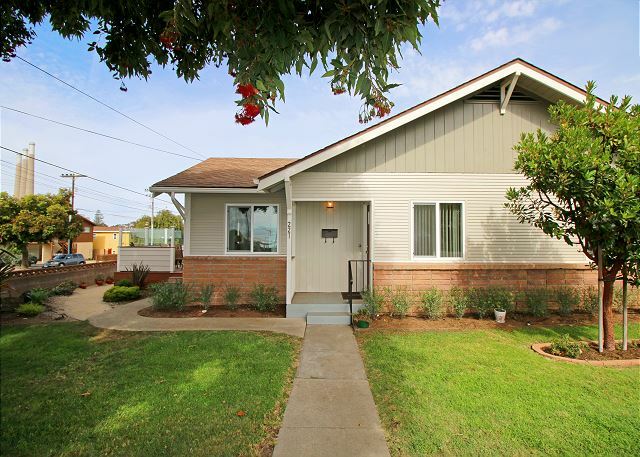 Perfect house for family visit to Cal Poly student. Great place to hang out and have a home away from home. Family dinners, baked cookies and just relaxed with each other. Stayed in this home for the month of July and loved it. Felt like home. Cute little house very clean and comfortable. 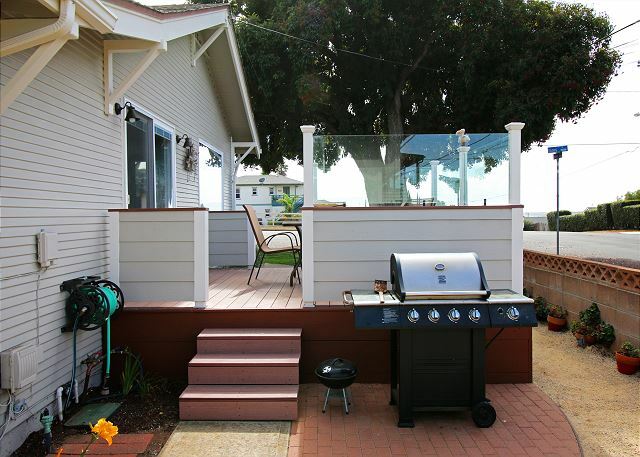 Perfect location for enjoying all that Morro Bay has to offer. We stayed last year for a month and enjoyed it so much came back for another month. Breakfast at Dorn's, dinner at the Galley, fish and chips at Giovanni's. Great views. Have bragged about house and location to everyone. Would definitely recommend. The location was amazing. Sitting on the couch in the living room you could actually see the water and waves. 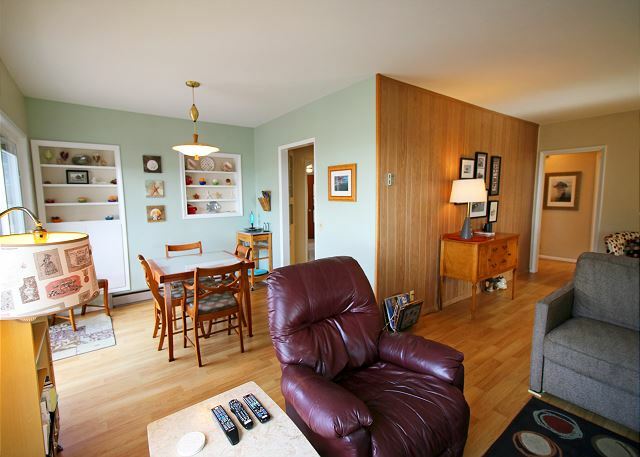 This house was less than 2 blocks to shopping, resturants, 1/2 mile to sandy beach. 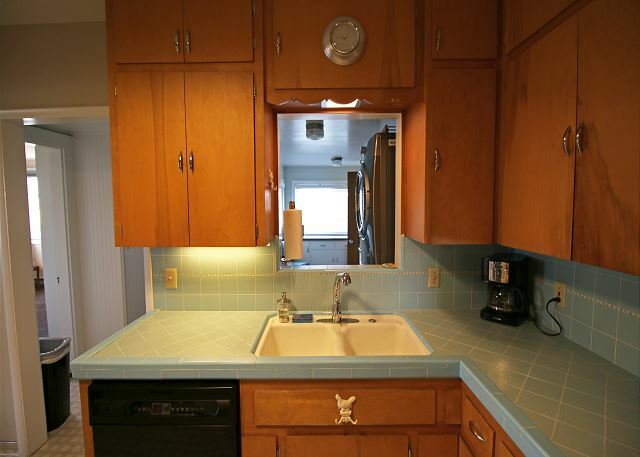 The downside was that cabinets and closets were full of linen, no room for your own stuff. Marissa was great to work with. we came up for the Thanksgiving holiday with our family (two kids in college and my father). The rooms were so big and spacious with lots of space for clothing, etc. 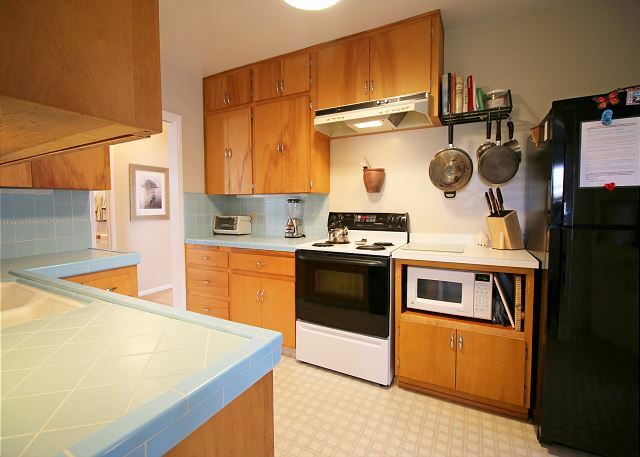 and the kitchen was packed with all of the cooking pots and pans one needs to cook a holiday dinner. The location was awesome - so close to walk downtown and beautiful sunsets to watch at the end of the street. Loved the decor and all of the fixtures. The main bathroom door handle is difficult to open, however. Can't wait to come back and stay there again! Thanks for a wonderful stay! 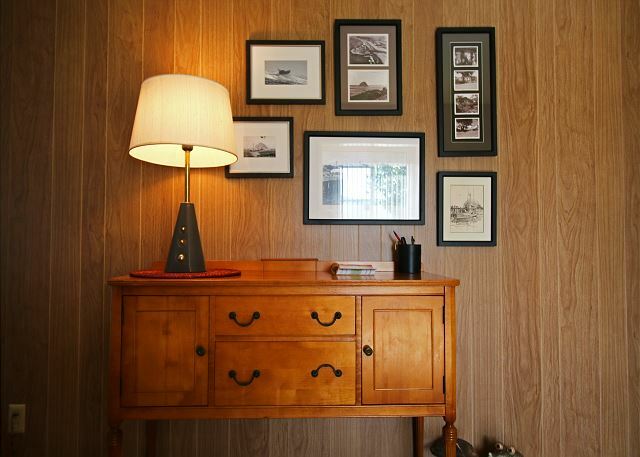 The home itself is old, but the owners have done a lot of work to update it but still keep that vintage retro feel. The sofa bed is so comfortable- our kids actually fought over who got to sleep in it. We never had to drive, we were able to walk all over town which was refreshing. Marissa is the only person we dealt with at the property management office and she was very helpful and made our trip run flawless. We hope to be back next summer! M.B. But with a family of 6-8 with cars boogie boards,bikes.etc, it was very difficult without a garage. I think the rent was high with this drawback, but we(as a family tradition) have come to M.B. every summer, now starting with the sixth generation; also,the trash cans supplied could not handle the supply generated during the week.But, we truly did enjoy our stay,especially the location! This is the most comfortable house rental I have ever had the pleasure of staying. Not only was it exceptionally clean, well maintained, and decorated, I love it when a rental house has the leftovers of the past renters. There was stuff to make chocolate chip cookies, leftover drinks cans and bottles, medicine, vitamin packs, and anything else you can imagine that is safe to keep around for the next guest. 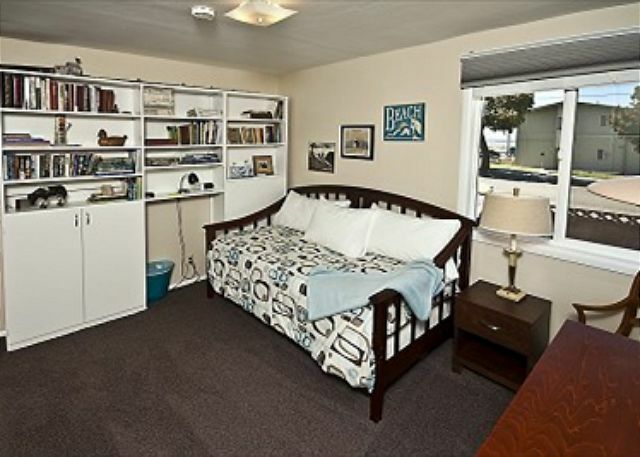 It's in a great location a block away from the Embarcadero and close to many things Morro Bay has to offer! Thank you! Darling 1950's house freshly redone with retro artistic feel. 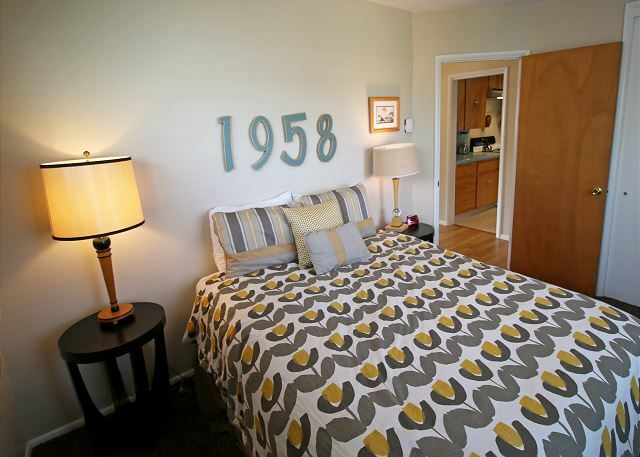 Darling 1950's home freshly redone retro style with artistic flare. 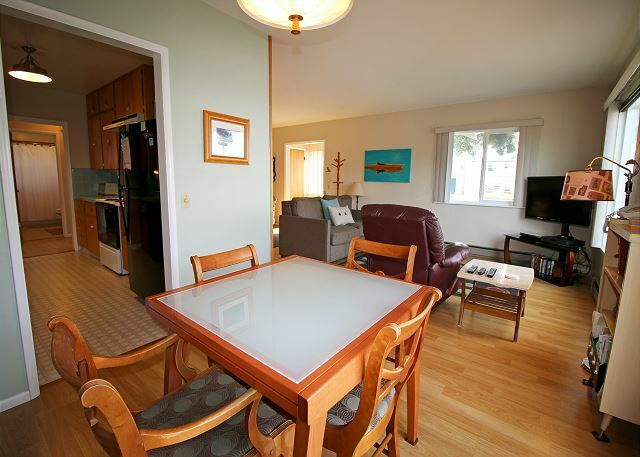 Located three blocks from laid back downtown Morro Bay and two blocks from Embarcadero. Bay view from living room window.